It’s an article of faith in some quarters—well, most quarters—that in the United States, owning a home ought to be a surefire way to build wealth. Whether it’s presidents, anti-poverty groups, foundations, or realtors, we’re always being told that that homeownership is the foundation of the American dream, and a key way secure one’s financial future. For a long time, it certainly worked out that way for a lot of households. Real home prices in the US outstripped inflation by a wide margin. Home equity rose. If you bought a house in the 1960s, pretty much anywhere in the U.S., it was worth a lot more two or three decades later. Collectively, and after adjusting for inflation, the real value of home equity owned by U.S. households increased from 1 trillion in 1960 to 2 trillion in 1975 to 8 trillion before finally peaking at more than 14 trillion in 2006. Because of this record, we’re told that promoting more widespread homeownership is an effective way to lift low-income families out of poverty, and to help racial and ethnic minorities—who’ve long had lower than average rates of homeownership, to build wealth. The implication is that the 40 percent or so of American households that don’t now own homes would be better off, all things equal, if they were able to buy a home. But as the standard investment disclaimer goes, “past performance is no guarantee of future results.” That warning is especially true for low income households and minorities who are now renters. Housing can be a good investment if you buy at the right time, buy in the right place, get a fair deal on financing, and aren’t excessively vulnerable to market swings. Unfortunately the market for home-ownership is structured in such a way as to assure that low-income and minority buyers meet none of these conditions. For these Americans, there’s no guarantee that homeownership builds wealth; in fact, tends to be a risky proposition that often produces financial hardship. First, you have to buy at the right time. The old adage is to buy low and sell high.Jordan Rappaport of the Kansas City Federal Reserve Bank estimates that buying has outperformed renting on a financial basis only about half the time since the 1970s; so those who buy during the “wrong” half stand to be worse off. And low-income and minority buyers tend to be disproportionately drawn into the market at these “wrong” times. That’s because the best time to buy, from a wealth-building perspective, is when housing prices are low and growing sluggishly. But generally, such times coincide with limited credit availability: home lenders ration credit according to credit score, and only the “best” borrowers have access to home loans when prices are low. As the experience of the last housing bubble showed, low-income and minority buyers came into the market most strongly as lending standards were relaxed, relatively late in the cycle. Those who bought in 2001 (when the market was depressed) fared very differently that those who bought in 2006 (at the height of the bubble). Easy credit nominally made homes more affordable, but also drew ever more borrowers into the market to bid up the prices of homes until the bubble popped. Because of this inherent quality of the credit cycle, the poorest borrowers are drawn into the market at the worst time to buy—when prices are at their highest. Second, you have to buy in the right place. Opportunities for home appreciation vary enormously, not only by region of the country, but by neighborhood within metro areas. Ethnic minorities tend to buy in neighborhoods that have lower rates of home price appreciation. 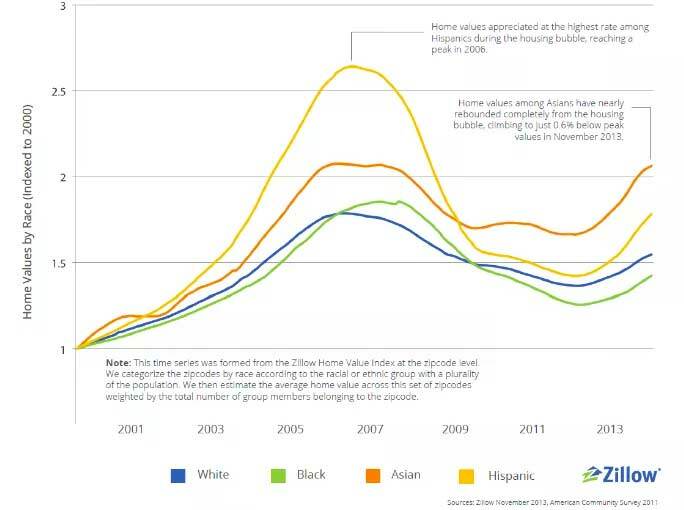 Zillow’s Skylar Olsen analyzed the data on home price trends by race and ethnicity. They show that Black and Hispanic households experienced bigger declines in home values as the housing bubble collapsed, and a slower rebound as it recovered, leaving them worse off that the typical white homeowner. And that’s not a result of Black and Hispanic buyers being poor judges of neighborhood quality: In segregated housing markets, the behavior of whites to avoid Black and Hispanic neighborhoods means that it’s much more difficult for those communities to see consistently rising home values. Third, you have to get a good deal on credit. The evidence is that low income borrowers and ethnic minorities pay, on average, higher interest rates. A 2006 study for HUD found that after controlling for household, property and loan characteristics, black households pay interest rates that are 21 to 42 basis points higher than whites, and hispanics pay rates than are 13 to 15 basis points higher. Federally guaranteed home mortgages must pay fees based on their riskiness, as measured by the mortgage’s loan-to-value ratio and the borrower’s credit score. Because minority buyers tend to have lower down payments and worse credit scores, it’s estimated that they pay guarantee fees that are 50 percent higher on average than white buyers. In addition, we know that low income and minority borrowers were the targets of predatory lenders. If you pay more for your mortgage, that raises the cost and lowers the returns to homeownership. Finally, in order to build wealth with housing, you have to have the ability to weather economic cycles. Low income and minority families often have limited financial resources beyond the equity in their homes and therefore are poorly positioned to cope with financial setbacks—loss of a job, a major medical expense or home repair—and missing mortgage payments can quickly push them into default. And highly leveraged home buyers (who get 90% or greater mortgages) are vulnerable to lose their entire investment in the face of even a modest decline in home prices. As Atif Mian and Amir Sufi have documented, conventional US mortgage loans are a risky, one-sided bet for borrowers. If you buy at the wrong time, if you buy in the wrong place, if you pay too much for for the money you borrow and don’t have the financial wherewithal to weather economic turbulence, chances are that home ownership could turn out to be a wealth-destroying, not a wealth-building, proposition. It clearly was in the aftermath of the collapse of the housing bubble.